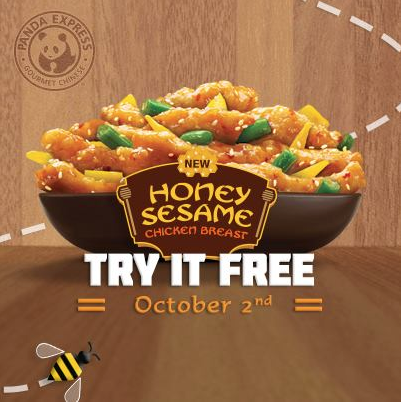 Today only score a free order of Panda Express Honey Sesame Chicken! There are 37 freebies today. Let us know in the comments if you learn of any more freebies, deals, or discounts. Don’t forget to follow us on Twitter @BargainBabe to snag more freebies. Follow us today. Free Panda Express – Today only you can score a FREE single serving of Panda Express Honey Sesame Chicken! No purchase necessary. Simply “like” the Panda Express Facebook page and click on redeem offer. Then print out or show on your mobile phone the offer at your local Panda Express. While supplies last. Only one coupon per person per day. Not valid with any other coupons, discounts or promotions. Free Custom Photo Mug – New customers to Snapfish can get a FREE Custom Photo Mug! Simply join Snapfish for free, upload your photos, and create your photo mug. The discount is automatically applied at checkout. There are many designs to chose from and would make the perfect gift for teachers, moms, and grandmothers! Standard shipping is not included and will cost around $5.99. You must make and order your mug by 10/31. Free One Year Subscription to Nutritional Outlook – Hurry to score a FREE one year subscription to Nutritional Outlook Magazine! Simply fill in your information and you will receive your one year subscription. Free Walgreens Photo Prints – Until Saturday 10/4 you can score 25 FREE 4X 6 photo prints at Walgreens.com! Simply upload your pictures to Walgreens.com, choose 25 or more 4×6 photo prints to produce and at checkout enter coupon code 25FREEPRINTS! To make this purchase completely free avoid shipping charges by choosing in-store pick-up. Free Video Game – Grab a FREE Valhalla Knights Game download from the Playstation Network. You can access the game using your Sony entertainment network. Once you’ve downloaded the game use your Sony Entertainment Network login to access all of your games in the cloud. You can download it to either your PlayStation or a Playstation Vita. Free Protein Shake Sample – Grab your Free sample of Nature’s Bounty Optimum Solutions Complete Protein and Vitamin Shake Mixtoday! Simply take a quick 3 question beauty quiz and you’ll be sent a shaker and a random flavor of the new shake mix! Free Redbox Movie Sample – Get a FREE one-night DVD rental from Redbox by using the coupon code MCPC413S. Valid through October 23, 2013. This code is will not work online. Thanks Money Saving Mom! Free Hair Care Sample – Score a FREE sample of Garnier Fructis Triple Nutrition Hair Care from their website. Simply click on the yellow “Get Sample” on the bottom right of the page to access the form. Your free sample should arrive within 8 to 10 weeks. Free Red Lobster Appetizer – Print this coupon for a FREE order of Red Lobster’s Crab & Seafood Stuffed Mushrooms when you purchase two dinner entrees. The coupon expires on October 20th. Free Skincare Sample – Request a FREE sample of Simple Facial Skincare moisturizer or facial wash from Target. Scroll down and click on the “Request Sample” button. Answer a few quick survey questions and expect your sample within 8-10 weeks! Free Dwell Magazine– Score a FREE one year subscription to Dwell Magazine courtesy of Rewards Gold. This is a great freebie so make sure to grab it fast! B2G2 Free at Ulta – Snag some great deal’s at Ulta’s Buy 2 Get 2 FREE Mix and Match sale! All ULTA Cosmetics, Professional Primers and Nail, Cosmetic Brushes, Beauty Tools, Implements, Bath, Anti-Bacterial, Smoothies, Skincare and Haircare products are up for grabs! You can get an additional $3.50 off a purchase of $10 by using promo code 101957 at checkout! Free Fire Safety PreK Pack – Download a FREE Fire Safety PreK Pack from Royal Baloo. In this pack you will find activity sheets on matching, counting, patterns, tracing, puzzles, and more. Free Kids’ Fall Activity Pack – Download a FREE printable Fall leaves activity pack straight to your computer. This pack has activities for children between the ages 2-8. There are over 70 pages of activities so this should be able to keep your little one occupied for a while! Free Coloring Pages – Simply print out these 5 FREE Despicable Me Coloring Pages and your children can enjoy coloring all of the different Despicable Me characters! Free Halloween Ebooks – Here are some FREE Halloween Ebooks books available right now on Amazon. This Ebook can be sent to your kindle or straight to your computer by downloading this FREE Kindle Cloud Reader. Download fast because Amazon prices can change at any time and remember to make sure the price is still $0! Thanks to Wicked Cool Deals! Free Bag of Rice Puffs – Score a FREE bag of Baked Vermont White Cheddar Rice Puffs! Simply like the Real McCoy’s Snax Facebook page, and click on on the “Free Snacks” tab to request your sample. If you get two friends to apply for a sample (by sharing a provided bitly link) you will be entered to win a Summer BBQ Basket. Free Halloween Tote Bag – Free York Halloween Trick or Treat Bag. The bag usually costs $9.99 and is customizable! Just choose the photo or photos of your choice and have them printed on the bag! The bag can also be used at an eco-friendly grocery bag. Simply design your bag and use the code: TRICKTREAT! This deal expires 10/31. Free Snapple K-Cups – Request a FREE Snapple Brew Over Ice K-Cup Pack from Target. Scroll down and click on the “Request Sample” button. Answer a simple 8 question survey and expect your Snapple K-Cups within 8-10 weeks! Free TGI Friday’s Appetizer – Download the TGI Friday’s iOS or Android app and register for their rewards program to receive a coupon good for a FREE TGIF’s Appetizer. Free Twinings of London Tea – Request 3 FREE samples of Twinings London Tea. Simply click on the link, choose your tea flavors, and your samples should arrive in 4-6 weeks! Free Sam’s Club – Print your Sam’s Club Invitation to Shop and take it to your local Sam’s Club for a FREE one day shopping pass! Scroll down on the page to find the PDF file to print. Valid thru 10/31/13. A 10% service fee applies on all non-member purchases when shopping with this One-Day Pass. Not applicable in CA, SC or Elmsford, NY. Outback Steakhouse Freebie – Through Oct. 3, 2013, you can get FREE Kid’s Meals at Outback Steakhouse with the purchase of an adult entree. Chipotle Freebie – Head’s up, iPhone users! Download the new Scarecrow game from Chipotle and ace the game for a coupon for a Buy 1, Get 1 FREE Burrito! The Scarecrow game is only compatible with iPhone 4S or newer, or you can use your iPod touch (5th generation), or iPad 2 or newer. Just play the game and complete all four levels to access your coupon for a Buy 1, Get 1 FREE burrito, bowl, salad or taco! Lowe’s Freebies – Register today for the FREE Lowe’s Build & Grow Kids Clinic on Saturday, Oct. 12 at 10 a.m. Kids will build a Spooky Stacker Game. They’ll also score a free apron, project patch and project kit. Each Kids Clinic only has between 50 and 100 spots and they fill up fast! Petco Freebies – Petco is offering a FREE Wellness Signature Selects, 2.8 oz can. Petco Pals members. Valid in-store only. You can sign up for the Petco Pals reward program in stores or online at Petco.com. Valid through Oct. 31, 2013. You can also score a FREE Can of Friskies Cat Food. This offer expires Oct. 15, 2013. Thursday Freebies – Free Custom Photo Mug from Snapfish! @Diane Hmmm…maybe they ran out of facial wash? Either way, I’m glad you got a freebie!